Australia is known for its vast energy resources. We’ve got ample sun, wind, biomass, natural gas and coal, and while these resources can be used effectively on their own, we can also use them to produce other energy sources, like hydrogen. Why use one energy source to create another? Our future energy mix will consist of many different sources to ensure we have energy when and where it’s needed, in the cleanest form. Through hydrogen, we can effectively create low-emissions energy for our own use, store it for later, or transport it overseas where it’s in demand. It’s a way to use what we already have, but tailored for a particular purpose. Reforming: currently the most common way of producing pure hydrogen whereby heat is applied to natural gas, causing hydrogen atoms to be separated from the carbon atoms. Technologies such as carbon capture and storage (CCS) can be applied to this process to limit emissions. Electrolysis: an electric current can be passed through water to separate hydrogen molecules from oxygen. Renewable sources could potentially be used to drive this reaction, making the whole process very clean. Biomass gasification: literally turning our trash into (gaseous) treasure, whereby a process involving heat, steam and oxygen can be performed to convert biomass (and waste products) into hydrogen. While the majority of hydrogen is currently produced from fossil fuel sources (around 96% at 2014), there is a real opportunity for Australia to produce low or zero emission hydrogen. We live on the continent with the most solar energy coverage in the world, so it makes sense to capitalise! How can we use hydrogen? Let us count the ways. It can support power generation, transport, food production, agriculture, and more. One of the most common uses is in fuel cells, combining hydrogen and oxygen to produce electricity, heat, and water. A fuel cell will produce electricity as long as fuel (hydrogen) is supplied. That means no recharging, and no harmful emissions. They are an option for creating heat and electricity for buildings, and electrical power for vehicles. Right now, we’re looking into the feasibility of hydrogen and fuel cells in powering major facilities like the MCG. One of the bigger challenges with hydrogen is that its low density means that it’s difficult to transport. To get around this, ‘carrier fuels’, like ammonia, can be used to take the hydrogen to where it’s needed. Almost counter-intuitively, ammonia (NH3) has a higher density of hydrogen that pure hydrogen (H2), so it’s a very efficient way to transport the fuel. And we already have much of the infrastructure needed to achieve this, even as an export fuel. Hydrogen can also carry energy to be used ‘on demand’, perhaps using our existing gas grid as delivery method. The concept of ‘power-to-gas’ means that hydrogen can be injected into the gas grid where it is effectively ‘stored energy’. This could potentially stabilise the fluctuations we encounter when the sun isn’t shining and wind isn’t blowing. We’re working on a number of technologies to increase the efficiency of hydrogen production, storage, and conversion to a suitable form for export and domestic use. These include inexpensive electrolysers to catalyse renewable production, membranes to extract hydrogen from carrier fuel at point of use and ways to use hydrogen to create synthetic fuels that can replace diesel and gasoline. 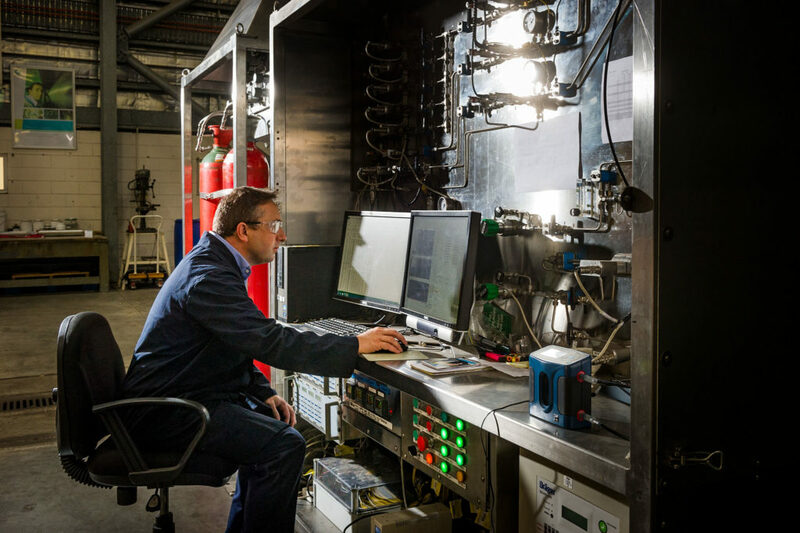 We also have a laboratory dedicated to testing ‘hybrid energy systems’, whereby two or more energy technologies are combined for overall benefits – hydrogen lends itself particularly well to these systems. Australia is known as a leading exporter of energy resources, but the time is right to take a leadership position in what could be the ‘next big thing’. We can use our rich energy resources to produce hydrogen, either as an export or to be used domestically in transport, power generation and to offset more carbon-intensive processes. We’re already seeing momentum. The South Australian Energy Plan released earlier in 2017 mentions hydrogen as an area for further investigation. Victoria announced funding for a commercial-scale hydrogen refuelling station for garbage trucks. And further afield, Japan has made clear its intentions for hydrogen to play a major role in powering its Tokyo Olympics in 2020. While technologies are emerging and converging, what’s needed is a central coordination point, and we’re seeking to do just that through a new Future Science Platform (FSP) focused on Hydrogen Energy Systems. This platform will help us development technologies that allow us to export solar energy, as well as providing low emissions energy solutions for Australians. From what we’re doing in the lab, to pilot and demonstration scale testing, there’s plenty of activity planned. We’ve also got a strong network of partners and collaborators to support current, practical research and technology initiatives across the hydrogen energy value chain. If the metallic ammonia-hydrogen membrane is commercially practical, this could truly be the technology that relegates fossil fuels to history. Transport is the last hurdle, due to the requirement for dense energy sources, so the benefits of this tech could be huge. That’s a long way away, though. Best of luck! Yul Brown was installing his electrolysis invention in cars at his garage in Granville NSW back in the 1970s and cars were in effect ‘Running on Water’ via a mixture of Hydrogen and Oxygen termed Browns Gas which was not stored under compression it fed straight into the carburetor and burnt in the motor. Various ‘educated folk’ panned Yul as being a scoundrel and a scam artist so he challenged them to prove him wrong. It shouldn’t work, but it actually does’. These days the vehicle’s on board computer could probably make it work even more efficiently. More work needs to be done on this old chestnut is the CSIRO up for it? ‘Extra Air’ where a port on the carburetor was opened manually by pulling a knob on the dashboard (when traveling down a hill) introducing filtered air from the air cleaner below the carburetor Venturi point so the fuel mixture jets were bypassed and played no part. The car wasn’t coasting down the hill (which is illegal) it was being slowed by the piston compressions as the motor was turned over by the drive shaft..
As the bottom of the hill was reached the port on the carburetor was closed manually by pushing the knob on the dashboard back in and the spark plugs resumed firing the air fuel mixture which powered the car up the next hill. No doubt this could also be enhanced these days by putting it under control of the vehicle’s on board computer, negating the necessity to pull or push a knob on the dashboard, it could be under control of a level sensing device such as a mercury switch that detects a down hill slope. All of these plans involve using energy to proceed. It looks like using solar electricity from somewhere to have less electricity somewhere else. Long ago, an English cartoonist, Heath Robinson drew elaborate machines for performing simple tasks. And the South Australians have mentioned it. It must be good; they are the ones building that battery to power 32000 houses for 2 hours.